We predict a fairly good year for most sectors within the Iceland Ocean Cluster, with tech companies and aquaculture probably leading the pact with 10-12% growth. TAC of Cod will increase by 5% 2013-2014 compared with previous years which is in line with quotas in many North Atlantic nations. This could set further pressure on Cod prices. Iceland’s seafood industry is utilizing its whitefish substantially better than most other nations. 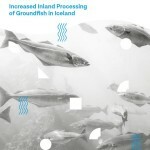 In 2014, Iceland will transfer this knowhow to the global whitefish industry. 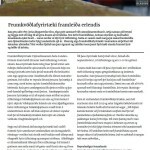 We predict the disputes between Iceland, the Faroes, Scotland, Norway and the EU regarding mackerel stocks to end peacefully in 2014. Too often, disagreements of this nature among governments in the North Atlantic prevent great opportunities to further strengthen cooperation between fisheries nations in the area. 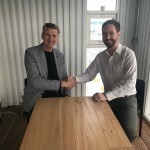 Settlement will lead to increased investments in the pelagic sector in Iceland. 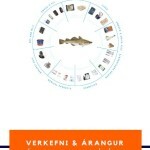 Iceland’s fish products will continue to compete with farmed fish, poultry etc. often with unsatisfying results for the natural and sustainable fish. 2014 needs improved marketing and further quality improvements. 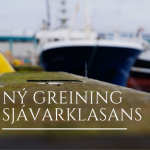 Iceland government R&D funding in fisheries is set to decrease in 2014. The national fishing industry will find itself in a situation where it cannot rely on government funding for R&D alone. The year 2014 can become remembered for venture funds overtaking government funding of R&D in the marine industry. 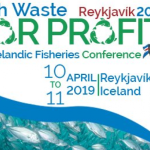 Leading fisheries in Iceland will further demonstrate their leadership in transforming the fishing industry into a knowledge-based industry. The year 2014 will further reveal which fishermen will become marine pharmacists in the next 10 years: fishermen who will develop their natural protein, enzymes, omega acids etc. into medicinal products. 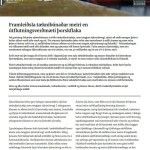 Recognition of Green marine technology will increase. Cutting edge environmentally friendly technology in fisheries and processing will receive increased attention. The Arctic will continue to be in focus in 2014. The Icelandic logistics industry operates the most comprehensive logistic network in the region. 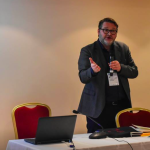 This network offers great opportunities to strengthen relationships with areas such as Greenland, Alaska (US) and Newfoundland (CA) and connect Arctic areas to North America and Europe. 2014 will see more activities of Icelandic ocean/marine enterprises and investors abroad: mostly Europe but also some key investments in Greenland and North America. The abundance of Icelandic water will become more interesting for inland aquaculture. The optimism surrounding aquaculture in Icelandic fjords will continue. Icelandic weather and climate stage the most significant risk to the business – more so than in most other countries. We are certain that the change of pace in 2014 will be exciting and that many opportunities lie ahead.